"From FinTech to TechFin: The Regulatory Challenges of Data-Driven Finance"
Abstract: Financial technology (‘FinTech’) is transforming finance and challenging its regulation at an unprecedented rate. Two major trends stand out in the current period of FinTech development. The first is the speed of change driven by the commoditization of technology, Big Data analytics, machine learning and artificial intelligence. The second is the increasing number and variety of new entrants into the financial sector, including pre-existing technology and e-commerce companies. 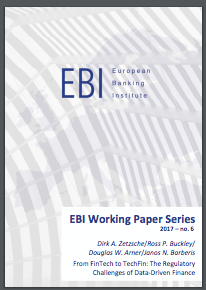 This paper considers the impact of these new entrants with their typically large pre-existing non-financial services customer bases. These firms (loosely termed ‘TechFins’) may be characterised by their capacity to leverage the data gathered in their primary business into financial services. In other words, TechFins represent an Uber moment in finance. This shift from financial intermediary (FinTech) to data intermediary (TechFin) raises implications for incumbent financial services firms, FinTech startups and regulators. This seachange calls for analysis to underpin regulatory approaches with a view to balancing the competing interests of innovation, development, financial stability and consumer protection. Click here to download the full paper.